Buy it! You won’t be disappointed! I read the book in 3 sittings. Zuzi gave her book to me in October. She was visiting Toronto at the time and we spent a few days together teaching Scrum – I was honoured that she would share a classroom with me and that I’d get a sneak peak at her new publication. Almost immediately after she gave me the book I found a few minutes to thumb through it and read the foreword and first chapters. I immediately liked what I saw. The foreword is written by Linda Rising who frames the book nicely by reminding us of these simple principles: “successful change is built around small steps and learning”, and “the book offers a chance for reflection and evaluation”. Zuzi’s preface describes briefly her journey to become a great Scrum Master. Hers is a story about humility and studious peristence; the journey is unique and difficult for us all. I could relate! The best aspect of the early pages in the book are the photographs of Zuzi. The book exudes her character traits: a friendly and insightful expert, a colleague and advisor. Her photos, as well as her illustrations throughout the book, help the reader to understand her colourful character; her stance as a coach and mentor; and her voice as an author. My time was limited so I didn’t get far in that first sitting though my first impressions of the book are memorable. It’s a big book – not thick, that’s not what I mean. I mean large, wide pages. Approximately 20 centimetres square. It’s the kind of book that lays open on a coffee table. This is important! I understand many people buy digital books but if you can find the book in physical format, buy it! The medium is the message, as Mcluhan said. The medium, in this case, is a lightweight book that rests easy, open-faced, on a desk or coffee table. As you pass by the table or sit for a while to enjoy a conversation, you’ll find the book open and waiting for you. You’re likely to thumb through it lazily, your mind wandering while on the phone or talking with a friend, then something will catch your eye. It’ll be a page you’ve looked at a dozen times but suddenly a sentence or illustration will stand out for you, draw your attention. Like, “…if you join a discussion with the core metaskill of curiosity it will be different than if you choose listening or teaching”. That sentence is on page 88 – that’s the one that jumped off the page for me today. I’ve read that page a few times already but this day, in this moment, that sentence resonates. Such a simple sentence on a page and sparse text and white space…but exactly the solace you will need. I was riding a train with the book open on my lap. Through the window passed the Canadian landscape, and I’d glance at the book between sips of coffee to take in another paragraph, picture, page. (See how cool the format is??) What I’ve learned from the next chapters of the book is that I share Zuzi’s interpretation of Scrum and of the Scrum Master’s role. Her perspective is a philosophical one, yet she effectively relates the material to practical examples. 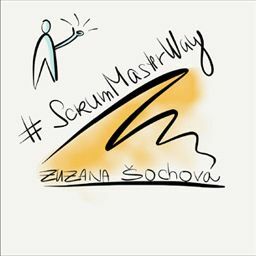 Zuzi describes a concept she calls the #ScrumMasterWay. This is an innovative model for understanding how a Scrum Master can adapt their mode of service depending on the conditions of the organization they serve. Perhaps at first, the organization they serve is ‘A Scrum Team’ – and in that mode of service a Scrum Master will facilitate Scrum and help the team to self-organize. Next, after all the easy fruit has been picked and the Scrum Team is capable of continuous and deep self-improvement, the Scrum Master’s mode of service is likely to change – the team no longer needs help with the rudiments so the Scrum Master may focus more intently upon relationships to and within the team. And finally, the 3rd level of #ScrumMasterWay is achieved when the Scrum Master is able to focus their effort toward the entire system, “bringing the Agile Mindset and Scrum values to the company level”. Reading about Zuzi’s #ScrumMasterWay concept in the previous sitting led me to think nostalgically about my own journey. I know this book, had she written it a decade ago, may have saved me from some mistakes of my own. I’ve come to more deeply appreciate her telling of the Scrum Master role. In the 2nd half of the book, she provides a glimpse into numerous related practices and concepts. A collection of references and teaching tools that most Scrum Masters will discover along their journey. For example, all Scrum Masters will find themselves in discussion with stakeholders about the nature of complex problems and, ta da!, like a stone tablet from a high mountain will appear Dave Snowden’s CYNEFIN framework! A simple diagram…it’s so obvious! All Scrum Masters will find themselves in a personal struggle between telling and listening: “should I coach as a teacher?” or “coach as a facilitator?” and, without fail, a fellow Scrum Master will recommend a training course with the Agile Coaching Institute to better understand the coaching stance(s). So, to help Scrum Masters along their journey, Zuzi has compiled many of the community’s greatest hits in her book. Einstein is often quoted as saying, “If you can’t explain it simply, you don’t understand it well enough.” Perhaps then, one can examine how well a person understands a concept by how simply they can explain it… right? By that measure, it’s evident that Zuzi understands her material as she’s able to distill complex topics to just a colourful drawing and a few bullet points. “Root cause analysis” is described concisely with 3 paragraphs, 4 bullet points, and a beautiful drawing of a tree. Her purpose, keep in mind, isn’t to make the reader an expert in root cause analysis – her point is as if to say, “remember…problems often run deeeeeeep in the system. They’re organic. Find the seed.” I’m hearing in my mind a wise old music teacher, telling the aspring young jazz musician, “remember Herbie Hancock…go listen to Maiden Voyage…behold the deeeeeeep groove and floating melodies. It’s organic”. The collection of materials which complete her book include highlights of Tuckman’s “Stages of Group Development”; Lencioni’s “Five Dysfunctions of a Team”; the martial artist’s progression through “Shu Ha Ri”; a shortlist of “Powerful Questions”; and a few others. In this last sitting, as I finished reading the book, I was struck by the similarity between Zuzi’s journey and interests and my own. I too have enjoyed Lencioni’s books, Tuckman’s model, the practice of co-active coaching. While I’ve lived and practiced all these years in Canada and Zuzi has lived and practiced in Prague, how is it we have been exposed to a similar body of knowledge and wisdom? I take some comfort in that, actually. Try our automated online Scrum coach: Scrum Insight - free scores and basic advice, upgrade to get in-depth insight for your team. It takes between 8 and 11 minutes for each team member to fill in the survey, and your results are available immediately. Try it in your next retrospective. 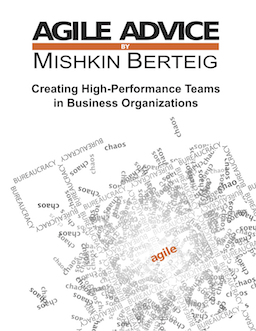 This is a great review of the book , anyone looking to buy it to learn more about Scrum and Agile should checkout this review it will help decide on whether or not one should get the book. Buy the eBook from lulu.com! ...or from the iBookStore! Fill in the in-depth survey to receive automated free customized advice on how to improve your Scrum team from our “coach-in-a-box”. Try out Scrum Insight here! Valerie Senyk on Should the AGILE MANIFESTO Require Certification – Before All Others? Rui Vale on Should the AGILE MANIFESTO Require Certification – Before All Others? A Software Engineer on Should the AGILE MANIFESTO Require Certification – Before All Others?